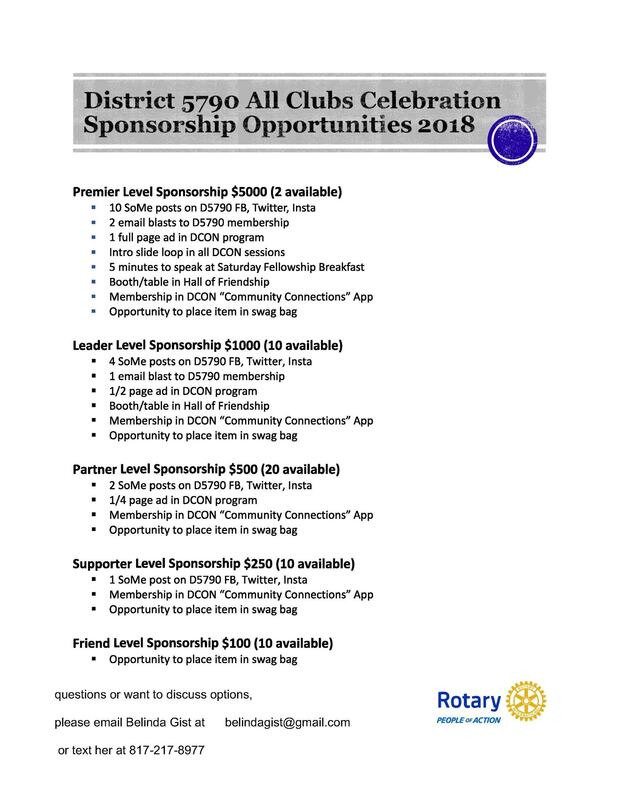 Rotarian Business owners and special event leaders: Now is the time to invest in sponsorship for the 5790 All Club Celebration. Sponsorship levels range from $5000 - $100, with tremendous advertising benefits for your business. The average Rotarian has a household income of $103k, a net worth of $670k. Seventy-nine percent of Rotarians are college educated, with 70% actively employed. The average age is 61. Does this sound like a group that you would like to grow your business with? This year, we have expanded the benefits of sponsorship to include, at varying levels, the opportunity to speak about your business at the conference, an advertisement in the program, social media posts, and placement in the new District 5790 “Community Connections” app. This app is custom designed for our district and will include Rotarian-owned businesses, serving as a directory for your fellow District 5790 Rotarians. Further, sponsorship support helps us to subsidize the costs of registration for the conference so that we may keep it open to as many as possible. Please consider investing today. Contract Belinda Gist at 817-617-2873 or at belinda@rt3p.com or Chris McLucas at districtgovernor1718@yahoo.com with questions and to register your sponsorship.